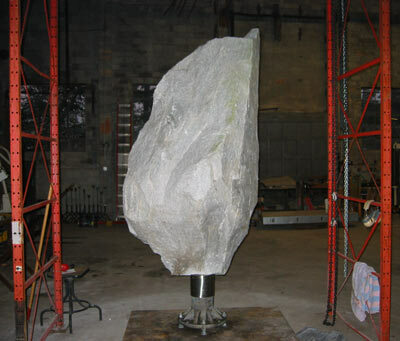 This spinning rock is a commissioned work of public art byZachary Coffin. I was hired to perform the engineering and CAD design work on the bearing and support system for the stone, using SolidWorks. The granite stone weighs approximately 12,000 lbs. The stone was core drilled to allow the bearing assembly to be mostly hidden within. All the weight is supported on a thrust bearing just below the hole, and a standard roller bearing 12 inches inside the stone keeps it upright. The vertical mass centerline of the stone was found by hanging it, and using lasers positioned at 90 degrees aligned with the hanging point. The lasers intersected at the base to indicate the drilling center. This was essential to insure the stone was perfectly balanced, so it would not wobble when spinning. Right: Exploded view of bearing assembly, and rebar reinforced concrete base. 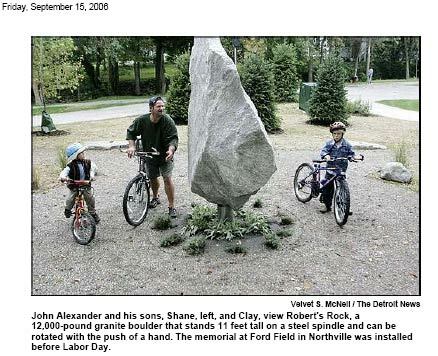 Roberts Rock in the News: Friday, September 15, 2006 - Below is a picture from the article published in the Detroit News.